Sales are all around during the holiday season, and once Boxing Day hits they only increase. It’s a nice message from a brand saying it’s ok to treat yourself to the thing you actually wanted for Christmas that no one got you despite your large hints, or at least that’s what I like to think. This morning I woke up to an overwhelming amount of emails regarding these sales, so I thought I’d do a post to help you navigate this sale period. 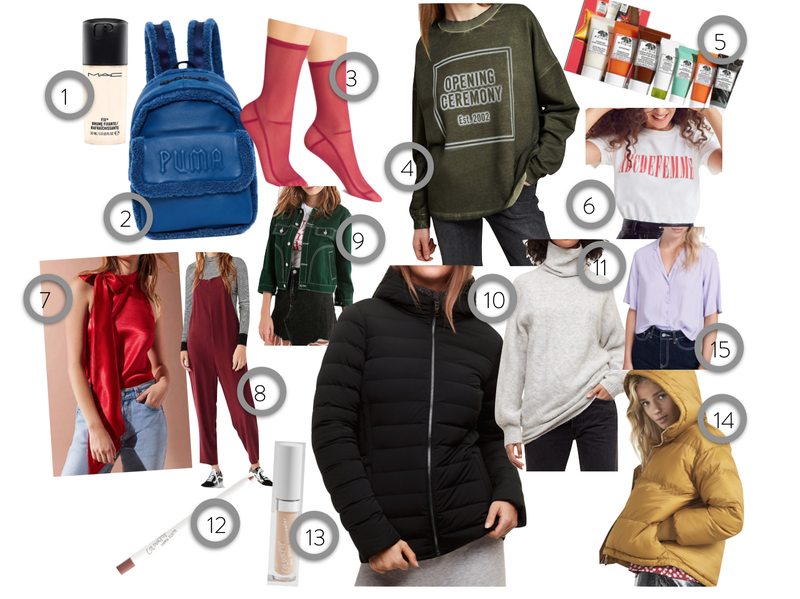 I am definitely addicted to shopping, and this lovely habit is not one that I am attempting to stop with a resolution, so look out for more of these posts throughout 2018. 1. This is the MAC mini Prep + Prime + Fix in coconut, they are also all flavours in a set on sale under the goodbye section which is all 40% off. 3. Darner Socks, also on Opening Ceremony. For me, a funky sock can complete an outfit. 4. The Cozy Stencil Sweatshirt from Opening Ceremony is always on my wishlist. 5. Origins is one of my absolute favourite skincare brands and they are offering 25% off their holiday gift sets. They have so many sets that there is definitely something for everyone. You can also receive a free Ginzing duo with the code MASCARA. 6. Like OC, Urban Outfitters always has a sale on, and right now they are offering an additional 30% off all sale items. You can’t go wrong with a feminist tee to ring in the new year. 7. This red shirt, also from Urban, is a great option for New Years Eve, and a sale is definitely the place to purchase items that may not be in your everyday wardrobe rotation. 8. These Urban overalls look extreeeemely comfortable, and the perfect cut to hide that extra bit of tummy from all the holiday eating. 9. I love the exposed stitching on this UNIF jacket, a nice everyday addition to the wardrobe. 10. Aritzia is one of my favourite brands. It’s everything I aspire to be, comfy yet professional and understated yet beautiful. My mother owns this jumper and I will definitely be stealing it when I’m home next week. 11. This Aritzia coat comes in black and maroon and I can’t decide which I prefer, maybe I just need both! 12. Over the second half of 2017 I really fell in love with Colourpop. Their products are so inexpensive but that does not take away from the quality at all. The sale includes 20% off all products as well as additional markdowns on specific products. I use their lippie pencil (lip liner) in Aquarius everyday. 13. I also love their concealer, blushes and highlights. 14. Nobody’s Child is an inexpensive brand with a great ethical background. Their sale is up to 70% off and includes this beautiful mustard coat. 15. I love pastel colour button downs to inject some colour into a smart outfit with some dark pants, and this Nobody’s Child lilac one does the job. I hope this is helpful and allows you to enter 2018 with the gifts you actually wanted to receive this holiday season, even if you did gift them to yourself.